Vibrant. Exotic. Bold. Unique. Suhaag Garden launches a new line of couture floral jewelry – tAnirika – designed for the new generation of fashion-forward brides and grooms. The pieces in tAnirika’s Spring 2013 collection do not beg for attention. Instead, the vibrant floral ensembles command heads to turn. Unique and eye-catching, this couture jewelry is a great alternative to costume jewelry for brides who want to make a bold statement. Versatile for any bridal style – casual, classic, vintage, romantic, or playful – tAnirika set any bride apart from the rest. The bold, vibrant designs by tAnirika will be showcased at a fashion show during the MyShadi Bridal Expo in Tampa on April 21.tAnirika’s Spring 2013 collection will be unveiled in a dramatic and memorable display. For brides seeking to accent their wedding trousseau with couture floral jewelry, the fashion show at the MyShadi Bridal Expo is not to be missed. Colors and jewelry can be customized to coordinate with apparel, and pieces can be shipped nationwide. 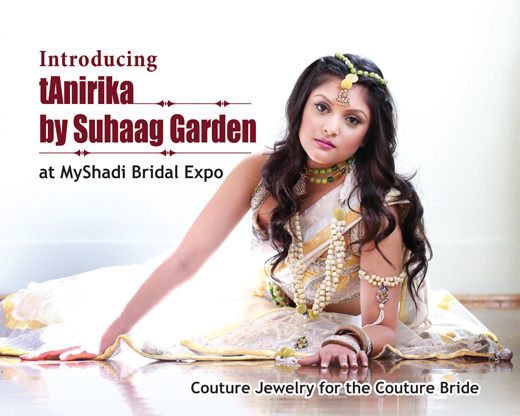 To learn more about Suhaag Garden’s couture line of jewelry – tAnirika, visit www.suhaaggarden.com. Find them on Facebook at www.facebook.com/SuhaagGarden, or call (561) 247-4298. To get an in-person preview of this couture line of floral jewelry, attend the MyShadi Bridal Expo in Tampa on April 21, 2013 at the Hilton Tampa Downtown (211 N. Tampa Street,Tampa, FL 33602). Admission and parking are free for all. Register to attend online at www.myshadibridalexpo.com.